Product: SB5800 Makoto Commercial Home Exercise Equipment Upright Bike with 40lb Fly Wheel, Electronic Console, Wheels, K5 Shock, Adjustable Handle Bars & Seat, Arm rest and Pro Pedal with Straps. 8 magnetic resistance levels (unheard of with most indoor cycling bikes)! Two Makoto exercise bike colors to choose from SB5800-Black, SB5800-Yellow. Makoto bikes SB5800-Champagne & SB5800-Pink have been discontinued. We offer local pickup in Logan, UT on the Makoto Bike to avoid the shipping costs. Pickup available within 2 business days from payment. Manufacturers Suggested Retail Price is $1100. Commercial bikes comparable to Makoto Exercise Bikes run for around $1300. High quality Makoto bicycles are now available for home use at a discounted price. Get in shape at home. This exercise Upright Bicycle provides a great cardiovascular workout with multiple resistance levels, electronic console to measure speed, pulse, calories and distance. Handle bars and seat adjusts to vary your workout. User can coast as desired just like riding a real road bike even while the flywheel rotates! This feature is safer than other bikes where people may forget to brake and just try to coast to a stop or take a brake, while their bike pedals keep going. Makoto Upright Bikes Weight capacity is 273 lbs. *Some have thought this product was Makota exercise bike, but it is actually Makoto Discount Exercise Bike. View our other exercise bicycles and info about our stationary bike products. 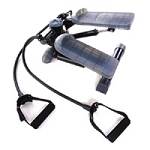 Competitive Edge Products, Inc. is an authorized reseller of Fitness Essentials Exercise Equipment. Q: I have this exercises equipment, but my electronic console just died, where I can by another console? Thanks very much for your time. A: Sorry but the manufacturer discontinued this item and I am unaware of where to get replacements. Q: Are parts available? Parts list? A: There are no parts available. Sorry for the bad news.